Before addressing what should be in your hurricane emergency kit for Floridians it is important to address when you should have it prepared and where you should store it. Your Florida hurricane disaster kit is something that you should have on hand throughout the year every year. Not something you should be scrambling to put together once a hurricane is about to make landfall. Clearly at this point stores will be closing or sold out of the items you need and it can be dangerous to be out on the roads. You should also have individual hurricane emergency kits for every member of your household. You never know who will be home when a hurricane strikes and if you may get separated. These hurricane kits should also be kept within easy reach so that they can easily be found and grabbed in the case of having to evacuate or an unexpected disaster hitting. The great thing about having a complete hurricane disaster kit is that they can also be used in the case of any other disasters, whether natural or man-made. Hurricane disaster kits for those in Florida are different than just stocking up on a wide range of supplies. There are many other items that you may want stock up on like gas and cooking equipment that obviously won’t fit in an easily portable hurricane kit. So do not confuse the two. Those items can be just as important to make it through the days and weeks after a hurricane, though the main purpose of an actual emergency kit is something that you can carry. This is even more crucial for those in coastal areas, like Jacksonville, Miami, Tallahassee, Ft. Myers, West Palm Beach and the Florida Keys who routinely need to evacuate. 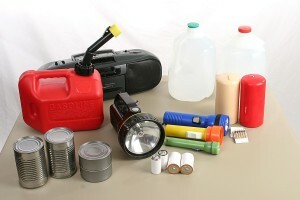 The items that you need to include in a well equipped hurricane kit can be broken down into several categories. These include food and water supplies, emergency and first aid items and personal items and paperwork. The easiest way to organize and pack your kit is to use a back pack and make sure it is waterproof or pack everything inside in plastic zip-lock bags. If you have children you may also want to make small items to keep them entertained during any disaster situations. Make sure everyone in your household knows where their hurricane kit is, create a plan and have fun running your own practice drills.